Landing pages are all the rage these days. 😉 Soooooo trendiiiiiing (said with SoCal Valley Girl accent). This article’s purpose is to give you an overview (plus specifics!) 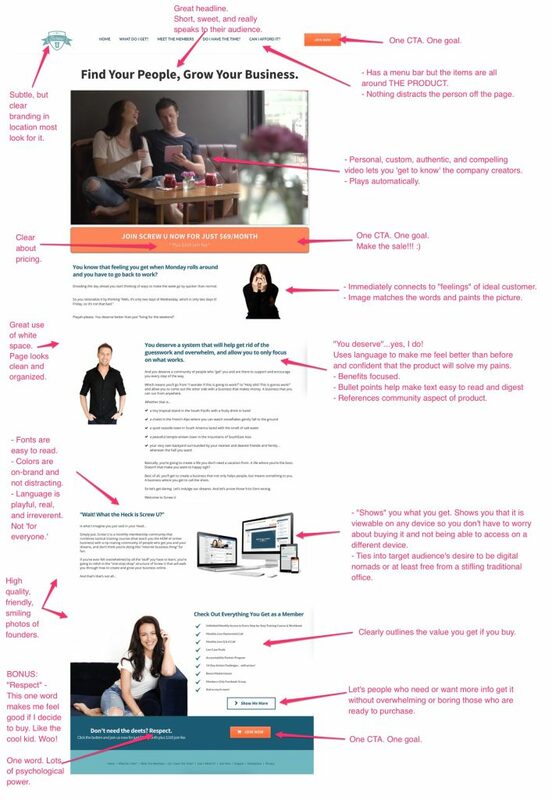 on how to create and optimize your landing pages for more email opt-in conversions and sales. I’ll look most specifically at landing pages that give away a lead magnet with the goal of list building. And I’ll look most specifically at landing pages that give away a lead magnet with the goal of list building. Part 1: What Are Landing Pages? And how can we build them? What is the audience’s problem, pain point, or deep motivation? What essential info needs to be communicated about your offer? Before I describe the tools you can use to create landing pages and the tips you can use to optimize them, let’s set out a few definitions so we are all clear and on the same page. Okay, that sort of covers it. Essentially, a landing page is any page online where one can land (or visit) coming from somewhere else. This could be coming from another page on the website – like the homepage – or it could be from an outside source – like a Facebook ad, a guest blog post, or an Instagram profile bio. But I would argue (strongly) that a good landing page is not your homepage itself. We’ll get into why in a second. Drilling down a bit more targeted for our purposes as entrepreneurs (and marketers), there are three types of landing pages that I will lay out for us here. For example, maybe you sell t-shirts and decide to run a Facebook ad. But the audience you are targeting with your FB ad doesn’t know you or your brand yet (a “cold” audience), so you decide to drive them to a landing page that has a bunch of fab photos of models rocking your T’s and a bit of a background on your company and mission. 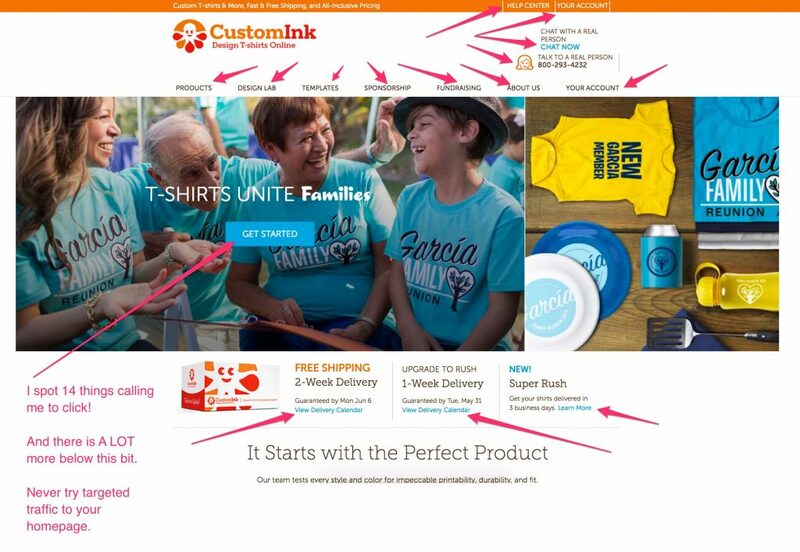 But also on the page, you place clear calls to action (CTAs) next to the products for sale and entice the visitor to click deeper into your site and ultimately make a purchase. Maybe there is even a one-time coupon code they can use when they check out to motivation clicking further too. Now let’s touch back on what I said before that your homepage is *not* the ideal page for a click-through landing page… or the other two types either! Most homepages are cluttered with menu tabs, subscription forms, internal links, buttons, and more. A smart rule of thumb (that we will cover in optimization later in this article) is to have ONE main goal for each landing page. 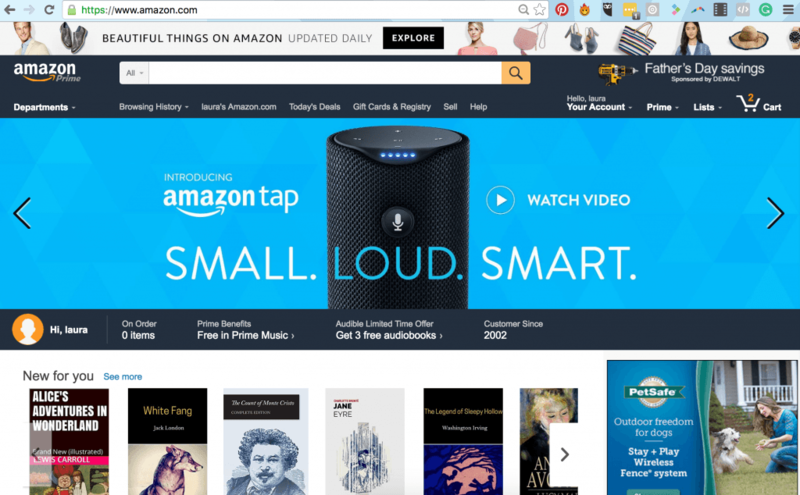 How many CTAs do you spot in this homepage? I counted 14 different actionable items above the fold (without scrolling) on this homepage above. And it scrolled a lot further too, so likely over 30 different actions that could be taken by a new visitor! That’s too many to send traffic to if you have a goal (and you should have a goal) with your traffic-driving marketing efforts. So remember, 99% of the time, homepages don’t make great landing pages. The purpose of this type of landing page is to …drum roll please!… capture leads. A visitor will land on one of these pages and will be propositioned with an irresistible offer that can be had for the low low price of their email address. 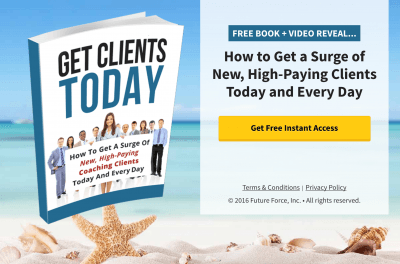 This irresistible offer is called a “lead magnet” and is usually a checklist, quick how-to guide, video tutorial, template, or other ‘quick win’ that will help your audience with their pain point without overwhelming them. A core component of any email list building / email marketing strategy. 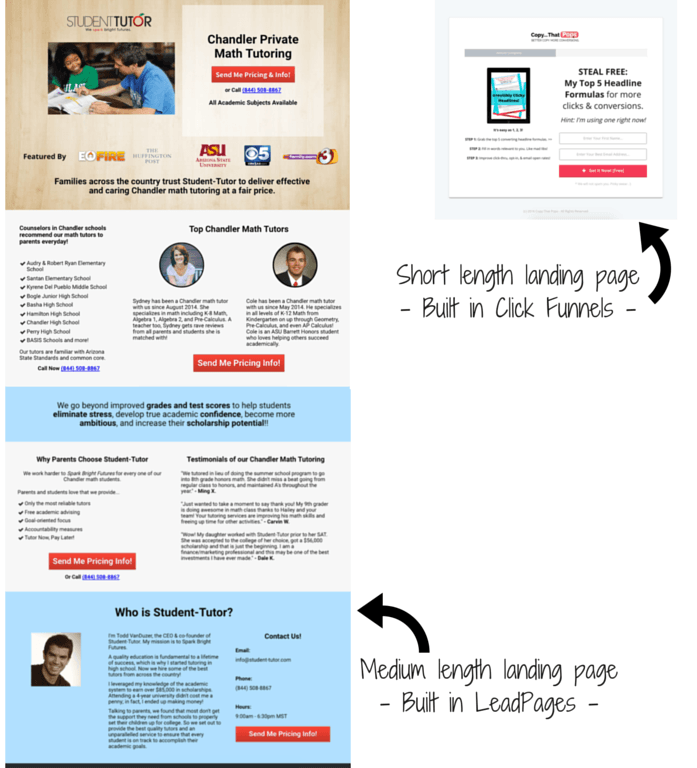 From my experience and research, lead capture landing pages are best when short and ultra-specific. You want to give just enough information so the visitor will know what you are offering in exchange for their email AND so the visitor will be enticed by the offer’s value. The internet is full of funny and flashy objects. You don’t have much time to capture attention and convince people that what you are saying is click and email-trade-worthy. So cut to the chase and make it clear! This is where powerful visuals and killer copy comes into play. Here’s an example from The Persuasion Revolution. 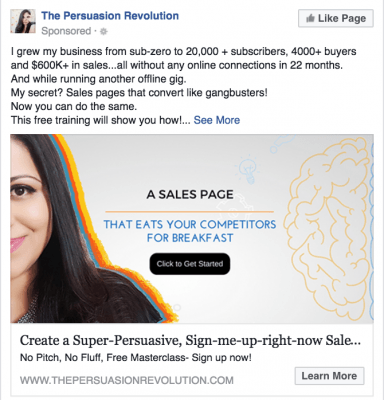 This one, in particular, was driving people to sign up for a free webinar for creating a persuasive sales page using psychological hacks. Sign me up! A sales landing page is where you are making your pitch to get your audience to hand over hard-earned money for your product or service. These tend to be a bit longer. The rule is… as long as it needs to be. Again, without confusing or boring the viewer. Here below is the first step of a sales page for the Screw the Nine to Five’s “Screw U” membership. Check out their sales page below for an example of awesome copy, visuals, and layout. I’ve added my thoughts in pink on the screen capture of their sales page. There isn’t anything to click on besides buttons that get the person to buy now OR learn a bit more so they can buy now. Brilliant. Fonts are clear and easy to read. Immediate and strong connection TO target market and WITH creators of the company. I don’t have a single critique of this sucker. Me likey! The good news is there are lots of different platforms and tools out there to build great looking landing pages! The bad news is… well, there are lots of different platforms and tools out there to build great looking landing pages so it’s hard to pick one and then once you do, you run into issues integrating things with other systems…. Long story short, there is a learning curve with ANY creation tool you select. And some platforms are more easily integrated with other tools than others. For example, when I used ConvertKit for email marketing, there was an extra step involving finding a snippet of code to get it to link up with my LeadPages landing pages. 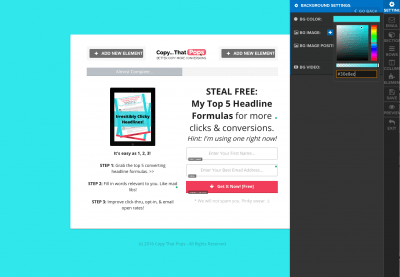 Whereas that extra step was not there when linking LeadPages with Infusionsoft or Aweber. That’s not necessarily a deal breaker, but it’s good to be aware that little quirks do arise. 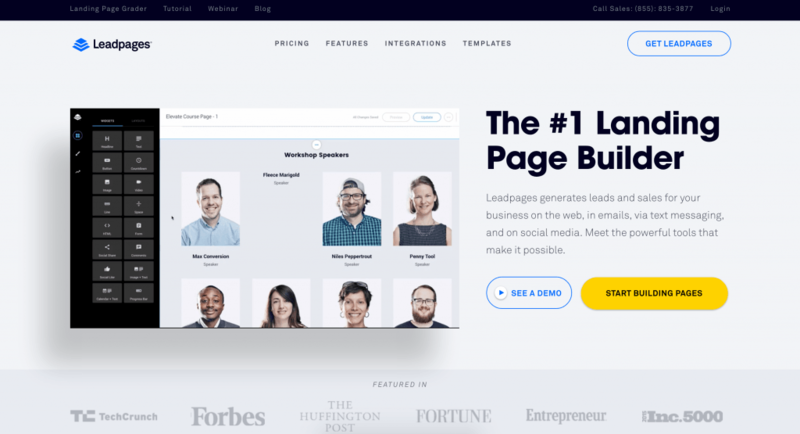 For now, I will list out six landing page building tools I know of and put a note by the ones I have personal experience with, plus add a bit of commentary at the end. Infusionsoft (IS) has integrated landing pages into their recent roll outs. Although I use them for email marketing and my CRM, I have not used their landing pages (my gut says they are not robust enough yet — but worth a try if you are already using IS or plan to — maybe you can save money and not have to buy a separate product for landing pages). From my experience with LeadPages (LP) and Click Funnels (CF), LP is easier to get started with and cheaper than CF. But CF is more robust in setting up sales funnels too and taking payment integrated into the platform. Here are two examples of landing pages from my own businesses. The one on the left is longer and is a Lead Capture and the one on the right is shorter but also a Lead Capture landing page. 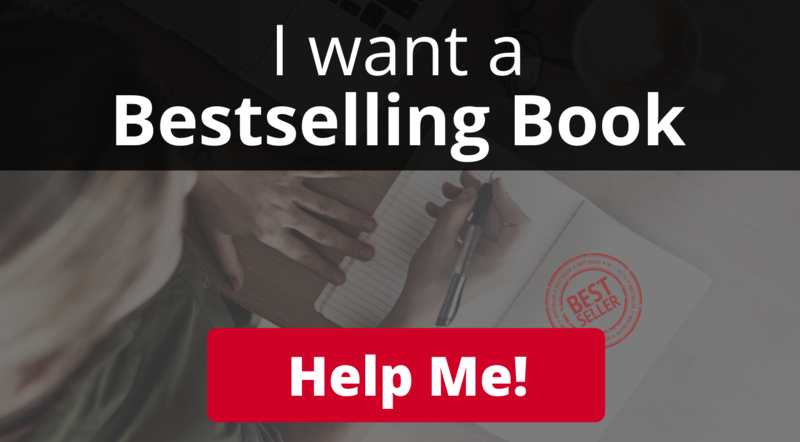 I recommend both LeadPages and Click Funnels and will be writing more detailed posts on each in the future along with video tutorials, so look out for those on the website here. Personally, I have never used Thrive but a lot of people in my entrepreneurial groups in Facebook use and recommend them. And with Thrive, you can pay a fairly low one-time fee and will be off and running versus the monthly fee with most of the others listed. Okay, so we have talked about #1, #4, #5 on the list. How about the others? #2 Hubspot: I have used for social media scheduling for a client I used to manage, but not for landing pages. #3 Instapage: I have no experience with but heard good things. #6 Unbounce: I have not used but love one of the founders, Oli Gardner and regularly read the great articles the company puts out on landing pages and digital marketing. So, #2, #3, and #6 I have also not tried, but I have heard about them from friends and colleagues, so I added them to the list to give you more of a variety in your research of the best option for you. A wonderful new biz buddy of mine posted this question on a post I made inside a Facebook group sharing that this blog was about to be written. And it is a great question! 1st: Tips to build landing pages. I would say start in the section above with finding the right techie tool to build them. Which you should choose depends on how much coding you know, your budget, your preference, and what other systems and platforms you are already using. If you Sya – or anyone else – wants advice based on the platform you use, comment below and I can help drum up resources for you! 2nd: How to choose the right contents to get people to opt-in. Trust me, I HATE that we always have to start here and go back to it, but it’s so true. Before you can do anything successfully, you have to really understand your target audience, or it’s just guessing and crossing our fingers. If you sell charm bracelets, for example, even that is not niched down enough. How you would speak in selling bracelets to 17 year-olds is completely different than how you would speak to moms with newborns or grannies with grandkids. 2. What is the audience’s problem? Or pain point? Or deep motivation? Back to selling bracelets, what makes people really WANT to buy a bracelet? – Is it to “look cool like all their friends who have them too”? – Is it to “capture memories and hold on to a feeling”? – Is it to “give grandma the feeling of pride that her grandkids gave her something thoughtful and now she can show it off to all her friends at church or Bunco”? 3. What is essential information to be communicated about your offer? To entice someone to want to trade their email for a freebie to opt-in to your lead magnet, you have to clearly state (and show with visuals is ideal too) what they will actually get. Then you have to choose your language well so that it feel irresistible. The exact combination of words will also depend on your target market and their desires. It takes some practice and also market research to refine your messaging and get it right. But once you do, it’s amazing the results. What are things your audience or current clients ask you about often? Keep a swipe file (a.k.a. Evernote or Google Drive Doc list) with questions that your audience has. An F.A.Q. list, if you will. 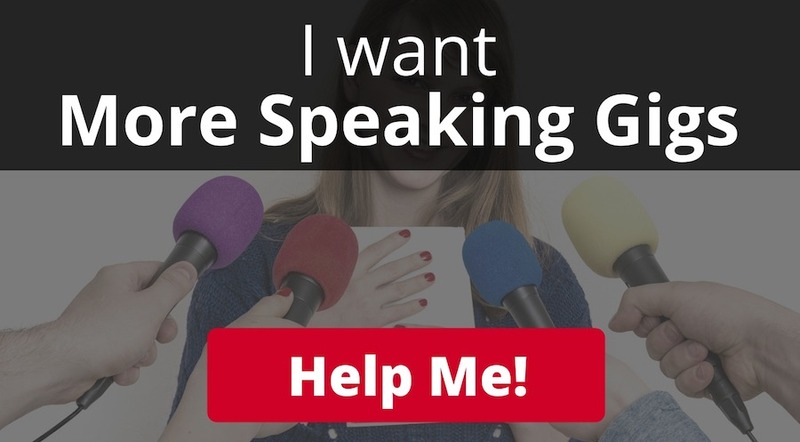 This will start to reveal what they want, the words they use, and how to best communicate to them so you can show that you can help them avoid pain or receive more happiness. Two other comments (above) that I got — and wanted to highlight from amazing biz buddies AND podcast episode guests Minling and Charlotte — had to do with landing page optimization. It is something we all can improve on. So let’s answer these questions by diving into the next section! 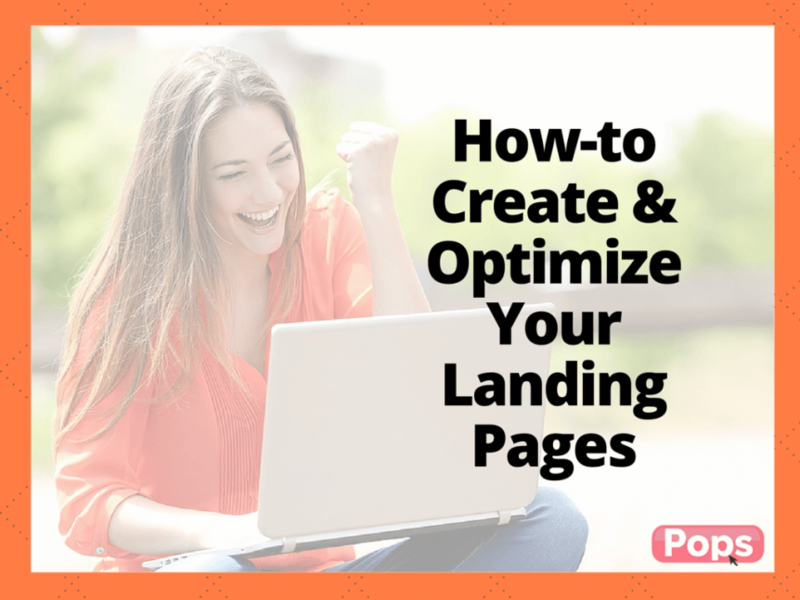 Alright, so if you have read everything in this post thus far, you are probably picking up some insights already in how to optimize your landing page. Sometimes optimizing for one of the above comes at the expense of another. For example, if you optimize for SEO in your blog title it may not be as enticing to click on as if you optimize the title for conversions. “The One Thing Successful Entrepreneurs Aren’t Sharing – And It’s Costing You Money” is optimized for conversions. It piques curiosity and appeals to a person’s self-interest to want to KNOW what am I not being told!? But if the article they open is about landing pages, then the title is missing that keyword and won’t get as much Google-juice as a result (though there are many factors that go into ranking). This is not to say that hitting all three optimization types is impossible. 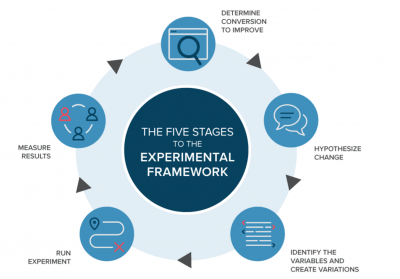 For the purposes of this article, let’s focus on goal #3: conversions… while still keeping SEO and UX in the back of our mind so we don’t wander down the “click bait” rabbit hole. If our NUMBER ONE… well, I should say SINGLE goal… is to improve our landing pages for more conversions (without being sleazy about it), then let’s have a look at some basics we need to make sure we watch out for. These need to hit a few targets. A. Colors, fonts, and images need to match the look and feel of what drove the traffic to them in the first place. If your visitors are coming from another page on your website, a Facebook ad, a social media post, a guest blog, whatever… no matter where people are coming from, there need to be some visual ‘anchors’ or tie-ins that let the visitor know immediately that they landed on the right place. This can be accomplished by making sure your logo is visual (in the same spot from page to page is ideal) and by using similar (or identical!) colors, fonts, and images from the step prior. A tip for making sure you always use the same colors is to write down the hex code for the colors of your brand. 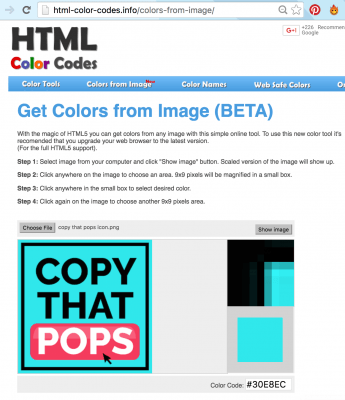 If you aren’t sure what your color codes are you can check out a site like HTML Color Codes and upload your logo or any image. Now, as in the example above I can take the code #30E8EC and use it in other programs to make sure all my materials are identically colored. 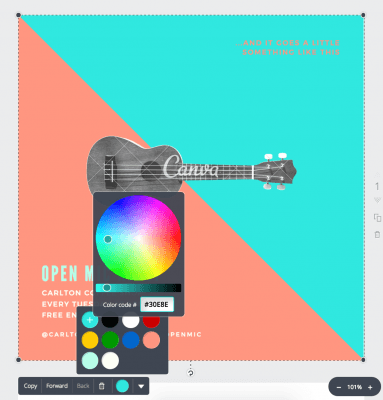 Here I entered it into the color tool in Canva to make it match my brand teal blue. Then here in Click Funnels, I can change the background or other parts of the page to match my exact colors. It’s a bit of a pain to write down and remember that exact code, but if you do, your stuff will look cleaner, more aligned, and go a long way toward improving your conversion goal. 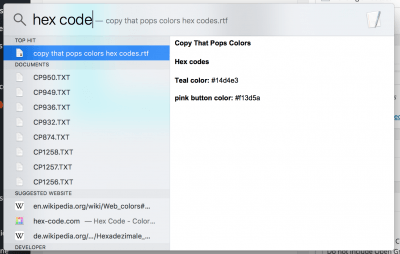 One last tip, I saved my hex codes in a text file (.rtf) on my computer so anytime I need them I hit Command + Spacebar (on a Mac) and type in “hex code” and mine pops right up there in the search. Saves me gobs of time. B. Images need to make no-brainer sense for being there. Remember the image of the girl with her head in her hands on Screw U’s sales page? That was lined up with the section about “feeling dread for another Monday morning.” a.k.a. ‘A case of the Mondays.’ haha, but don’t quote me on that phrase. It would have been LESS effective if they had an image of a calendar with Monday circled. While that is relevant and not completely terrible, people connect with other people. And tapping into emotion is ideal for encouraging people to take action. So use authentic, emotion-laden, relevant photos to improve your message and connect with your visitors. This will undoubtedly help your landing page conversions. Where can I find good photos? One of my favorite free stockphoto websites that doesn’t require attribution is Pixabay. If you want a list of 61 sites in total (that are free + no attribution), check out this blog I wrote on another website. I’m obsessed with free stockphotos. If you have a budget, check out BigStockPhoto.com. Their stuff is terrific and there is a free 7-day trial. C. Fonts need to be clean and clear. ANYTHING that is even slightly odd, out of place, or different for-no-clear-reason will confuse your visitor. You have about 3 seconds or less to make a good and clear first impression. If your fonts are crazy colors and there are a bunch of different styles and sizes you are taking up precious bandwidth from the reader and increasing their chance of bouncing. I personally use ONE sans-serif font and ONE cursive font for all of my branded materials. For example in this image below, “Make your … count” is in Open Sans Bold and “3 Seconds” is Shadows Into Light font. (Created in Canva). On a landing page, I just stick to the sans-serif font and mix up some heading sizes and occasional bold and italic for flavoring. My font is ALWAYS the same color. Usually black or a very dark gray. If I use a color for font it is usually for hyperlinks and then I use my brand’s pink color. Keep that point in mind as well. If you want people to actually click on links you embed, they won’t even notice them if your fonts are a ton of different colors. Don’t distract people from taking the next action. With spacing, I mean essentially the layout of the elements on the page. How close together are things to one another? I think we all have the natural tendency to brain-dump everyone we want to tell a prospect, and we have a hard time editing or cutting out stuff that actually isn’t helping conversions. But visitors are busy and if things feel cluttered or disjointed, they will not stick around to sort it out. They will move on to a cat video instead. Meow. This takes a bit of practice, but a great exercise to get better with it is to set aside 15 or 20 minutes and go visit your favorite websites. That could be Tom’s Shoes or Calvin Klein or Pat Flynn’s Smart Passive Income. It doesn’t matter the genre. But don’t get distracted and start shopping. Instead, take note of how YOU FEEL instantly when the page loads. How do you FEEL when you first see this? I feel overwhelmed. Not so much that I hate it and won’t use it… but it’s not a place that makes me feel focused and calm. Unless I know exactly what I want, I never go there at all. How do you FEEL when you look at this page? I feel more calm and confident that I will find what I need (assuming I care about landing pages). Notice their use of “white space” is significantly more than Amazon. There’s more padding around elements so things have some separation from each other. To me, this communicates that I can trust them to provide me with what I need. 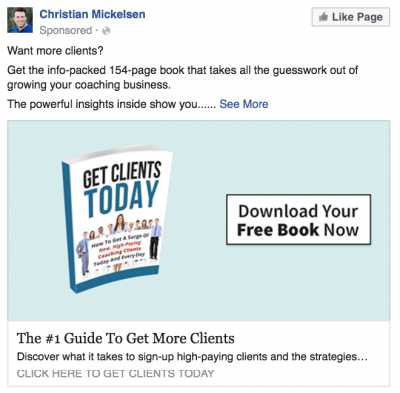 The social proof of the “Featured In” bar helps with that too. Explore some other websites of your own and just take note of how you feel and what in the layout of the page is contributing to that feel. Being in touch with this – just noticing it – will help you with your own design. We have to put headlines at the top of this list because research shows that about 80% of people ONLY read your headlines. 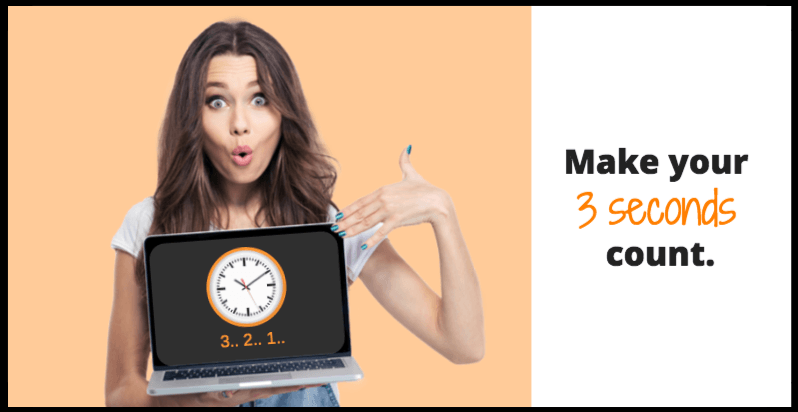 And with less than 3 seconds to make a good first impression online and entice someone to want to stay longer and read further, your main shot lies with the headline. Read this article with more in-depth tips for headline crafting! Raise your hand if you religiously employ the ‘5-second rule’ when it comes to dropped food stuffs. Well, good, me too! It has been scientifically proven that germs wait 6 seconds to jump onto your food, so this is perfectly logical. Now, let’s get even smarter and apply the 5-Second Rule to our landing page. Convince a friend or family member to give you 2 minutes of their time. Sit them down in front of a blank computer window. After 5 seconds, close the landing page. Tell me all that you remember about the screen you saw. What was the purpose of that page? What was the next action the page wanted you to take? How did the page make you FEEL? Gut reaction. What did you like / what didn’t you like about the page? Note that if they are resistant or say, “I don’t know” reassure them that there are no wrong answers and you will not take personal offense. Tell them how important someone’s gut reaction is, so you really welcome any thoughts whether they are good, bad, or indifferent. This information will tell you loads. Remember that you have about 3 seconds to make a good first impression. So if someone looks for 5 seconds and can’t tell what the point of the page was, can’t tell you what they were supposed to do next, and report feeling confused or put off, you have some work to do! The maximum time investment from the friend is a minute or two and it will give you valuable insights. Ultimately, to really see what works and what doesn’t, we have to run tests. Business decisions made based on opinion and ego are sometimes correct, and most times wrong… or at least not as effective as they could be with real data to back it up. So really, you can think and guess all you want, but in the end, you have to try something, see how it works. Change it, see how it works. Or better yet try two variations and drive traffic to both at the same time and see which does better! Important: Make sure this is randomized! – Do not send traffic from one source to page A and another source to page B because now you are confounding the variables (a.k.a. messing up the data). – You may draw a conclusion that is not founded on the actual data because of this biased distribution of traffic. The above image is from Optimizely, an application I used to use at my tutoring company Student-Tutor for testing elements on our website. You can also use the built-in split testing functionality of platforms like LeadPages or Click Funnels. Final tip: use language directly from your clients’ mouths. Colors, fonts, and images need to match where traffic came from. Fonts need to be clean and clear. As you can see, this is a meaty and important topic! I could talk about it for days! 😉 But for now, I hope that this was a solid overview for you to get going (or improving) with your landing page creation and optimization. • What new ideas sparked for you?